Its no secret that I love to organize. I love to buy containers to organize and group like items together. For the kitchen this cracker jar from Target is my favorite item. I use it for most items in my cabinet, such as: tea bags, rice, brown sugar, powdered sugar, coco powder, oats for my oatmeal and many others. 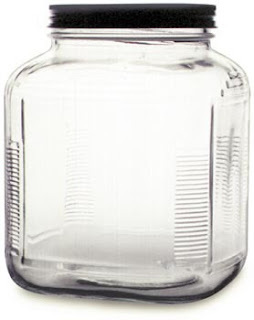 (the flour and sugar go in larger glass containers) At around $3.50 for the medium size jar, its quite the bargain. The ones I use are made by Anchor Hocking and can also be found at the Container Store and other places like that. I love those jars. I especially love when people use them in their office space and fill them with markers, pencils, etc.